Digital/New Media artist and Lecturer Tom R. Chambers lived in South Korea and traveled to Buddhist temples there on numerous occasions, interested in Buddhist philosophy. 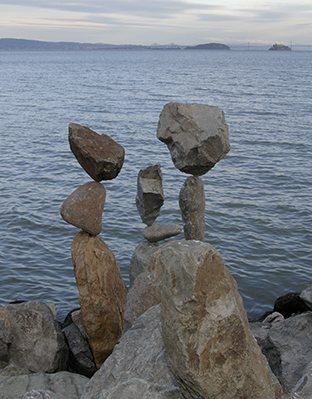 He noticed the practice of stacking stones as a form of worship and asking for good fortune. To document this behavior, to compare these stone formations as a study in technique, and to pay tribute to those Korean people involved with this form of religion, he created the work of art below. This scrolling collection of images originally presented on his website was designed as a "conceptual piece", and is republished here (in slightly modified form) with his permission. "When the stacks are compared, it's interesting to note the similarities in configuration, size and number. They all conform to the geometrics of pagodas that were constructed in the past, and move upwards and towards the ethereal Buddha."